Philadelphia is taking its pitch for Amazon’s second headquarters to the streets of Seattle with a monthlong, shock-and-awe advertising blitz on the cityÕs buses and trolleys. Just when you thought the Amazon second headquarters scramble was over for a while, Philadelphia officials have found a way to continue courting the corporate giant. They're taking Philadelphia's campaign to the streets of Seattle with a month-long shock-and-awe advertising blitz on the city's buses and trolleys. The frenzied competition for Amazon's HQ2 technically culminated Oct. 19, when 238 cities submitted bids for the $5 billion development. Although Amazon is now evaluating the proposals, Philadelphia decided to keep its sales pitch going. Since Oct. 23, 48 transit vehicles wrapped with images of well-known Philadelphia beauty spots have been rolling through Seattle's South Lake Union and Denny Triangle neighborhoods, which have large concentrations of Amazon employees. The colorful bus wraps don't address Amazon founder Jeff Bezos directly, and don't use the "Philadelphia Delivers" slogan developed for the city's charm offensive. Instead, the wraps extoll Philadelphia's vibrancy and livability, touting everything from bike trails to beer gardens. There are 30 slogans, all variations of "Philadelphia: City of Brotherly Love." There's "City of Foodie Love," "City of Mural Love," "City of Rooftop Love," etc., each with a corresponding image. The goal was to keep Philadelphia on the company's mind, said Lauren Hitt, Mayor Kenney's communications director. "This targets Seattle residents and Amazonians alike," she explained. 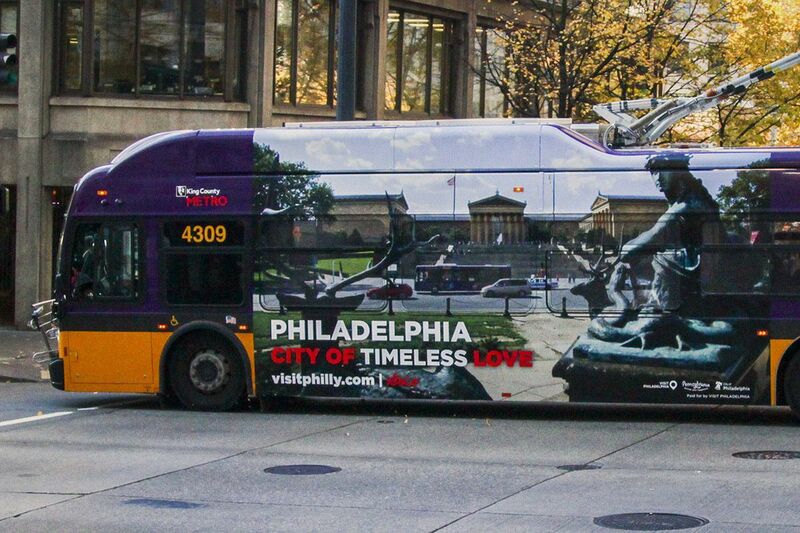 The advertising campaign was designed by Visit Philadelphia, which normally focuses on tourism, but this is not a standard tourist promotion. "It's more about presenting Philadelphia than promoting Philadelphia," said Meryl Levitz, Visit Philadelphia's president. Visit Philadelphia footed the $85,000 bit for the bus barrage, which continues until Nov. 26. Birmingham, Ala., tried to get Amazon’s attention by scattering giant sculptures of the company’s boxes around its downtown. Other cities have also tried novel ways to promote themselves with Amazon. Tucson, Ariz., tried to mail the company a 21-foot Saguaro cactus. Birmingham, Ala., scattered giant Amazon boxes around its downtown streets. Stonecrest, Ga., offered to rename a section of town after Amazon. New York lit up the Empire State Building with orange lights, the company color. The Kenney administration, Hitt said, wanted to be careful not to overdo it. "We wanted to stay on the right side of eager," she explained. "We don't want to come off like a lovesick teenager."